Downtown Napa Valley: A Christmas Wonderland! Downtown Napa Valley is so beautiful during the holidays: it is completely transformed into an incredible Christmas wonderland. The town’s 30-foot Christmas tree, located at Veterans Park, is adorned with more than 2,500 lights and 1,000 ornaments. 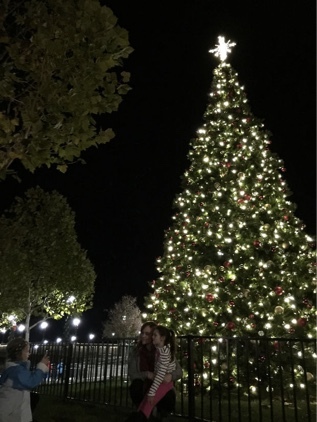 Gorgeous decorations and more than 35,000 lights sparkle throughout the entire Downtown Napa area, making it a welcoming, family-friendly haven for the entire holiday season. V Marketplace – Here you will find a variety of unique specialty shops, art galleries, and even a few places to sneak in some wine tasting. Back Room Wines Shop – Give your friends and family true Napa finds by visiting the fine wine shop in downtown Napa. These wines include some delicious ones you will not be able to find back home. Spice Islands Marketplace – Visit this fascinating marketplace where you will find the world’s best collections of culinary products, spices and unique concoctions. A Man’s Supply – For the man in your life, find fabulous clothing, brand name accessories, high-end camping and outdoor gear, and just about everything your rugged, yet classy, man will enjoy. Calistoga Olive Oil Company – For the culinarians in your life, bring home gourmet olive oils, soaps and all-natural snacks from this unique local shop. Napa Town Center – Here you will find outdoor shopping for clothes, food and accessories. Napa Premium Outlets – Find the latest fashions and enjoy massive savings from the premium outlets. Some top brands you can expect to find include Banana Republic, Cole Haan, Tommy Hilfiger and even Barneys of New York. Holiday Open House & Special Tasting – Hosted by the Viader Winery, this holiday open house starts December 5th. The annual party is hosted by the Viader family and features specialty holiday wines, expertly prepared appetizers and even delectable sweets prepared by their in-house chef. To bring in the season, they extend specials on all of their wines for that day only. Admittance is free, but RSVPs are required. Holiday Open House and Art Show – At the Black Stallion Estate Winery on December 5th, you can enjoy wine club prices, fine art and crafted appetizers as well as wines. All you pay is $20 per person or $15 for Napa Neighbors. Halliday at Our House – This black tie event includes a five-course dinner and some of the most cherished wines from Hall and Walt’s libraries. Spaces are limited and the event kicks off December 5th. Downtown Napa Valley is so beautiful during the holidays that it’s hard not to get into the Christmas Spirit! But this is only one of the many reasons I love living here. If you are interested in moving to Napa Valley, please contact me at 707-738-4820 or email [email protected]. I have a wealth of experience in wine country real estate and would be delighted to help you find a property where you too can make holiday memories!